In the first week of the 2019 calendar year, the Royals informed MJ Melendez that he'd be one of their 22 non-roster players invited to Major League Spring Training. Four of those 22 are catchers, like Melendez, bringing the total number of backstops in the Surprise, Arizona, camp to seven. Catchers are always in demand at Spring Training because there are a lot of pitchers, which means a lot of bullpen sessions, live batting practices and other side work. That's what allows a prospect like Melendez, who was taken in the second round of the 2017 Draft and spent all of last season at Class A Lexington, to jump in with big leaguers so quickly. But at a time when the catching position is weak in the Majors, the Royals' No. 3 prospect is more than just a warm body in Kansas City camp. The 20-year-old is hoping to show he's capable of developing into an increasing rarity: a catcher who's an excellent all-around player. He's already caught the attention of Salvador Perez -- an All-Star in each of his last six seasons and the Royals' backstop when they won the World Series in 2015. Perez, who lives in Weston, Florida, during the offseason, worked out with Melendez a few times at Florida International University, where the latter's father Mervyl is the baseball coach. Knowing the younger man wants to pick up the catching torch in Kansas City someday, the 28-year-old veteran made one objective clear. "More than anything, he talked about being there early," Melendez said. "That's something anyone can do, no matter of anything else. It's about showing you want to be there, being the one waiting for others. That's something that stood out to me." So since pitchers and catchers officially reported to Royals camp on Feb. 12, Melendez has tried to get on site between 6:30-6:45 a.m. every day, following Perez's words and -- literally -- his footsteps. There are few better role models a Minor League catcher could have these days. Since Perez became a full-time Major Leaguer in 2012, only Buster Posey (33.5), Yadier Molina (22.9), Jonathan Lucroy (20.6) and Russell Martin (19.0) have posted higher WARS than his 16.5, according to FanGraphs. Perez has won five of the last six American League Gold Glove awards for his position and two of the last three Silver Sluggers. It's a rare package today, when big league catchers are generally either bat-first (like Gary Sanchez) or glove-first (like the Red Sox combo of Christian Vazquez and Sandy Leon) but rarely both. Case in point: J.T. Realmuto led all Major League backstops with a 4.8 WAR last season, but that was just the 29th-best single-season mark for a catcher since 2000. Yasmani Grandal's 3.6 was second and 75th, respectively. As MLB.com's ninth-ranked catching prospect, Melendez may not look like the second coming of Joe Mauer, Posey or Molina just yet, but he's setting the foundation to grow into that type. 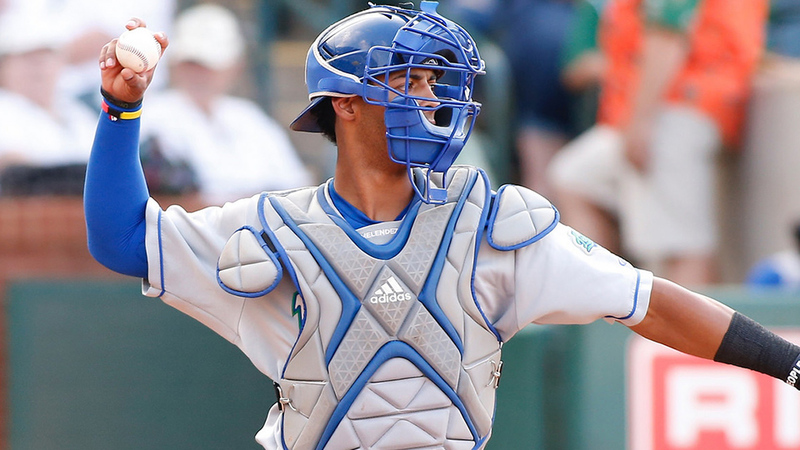 The Royals drafted Melendez out of a Florida high school with the 52nd overall pick in 2017, when his only plus skills were on the defensive side -- an uncommon trait among prep backstops. They talked him out of playing college ball for his father at FIU by signing him to a $2,097,500 bonus, roughly equal to the slot bonus of the spot 20 picks ahead of him and about $800,000 above the recommended money for the Draft position. With Melendez's size and strength (he was 6-foot-1 and 175 pounds), he did have offensive promise the Royals could dream on. But to this day, his self-assessment begins with his arm and his glove. "The way the game is going, everyone's [so] on about hitting, hitting, hitting that defense can get overlooked," he said. "That goes for catchers as well. I know I need to be a defensive-first catcher, even if it that sometimes gets lost in a game. My first thought is being the best possible defender I can be when it comes to framing, blocking, footwork, all that, and then I'll focus on hitting when I can. But defense is what will carry me." The Miami native has shown that early on, throwing out 34.8 percent of attempted basestealers in his first two Minor League seasons. What's more, his 41.9 percent caught-stealing rate with Lexington was tied for first among qualified South Atlantic League backstops last year. But it's the growth he's showing with his bat that makes Melendez one of the Minors' most promising catchers. In 111 games for the Legends, the left-handed slugger ranked fifth in the Sally League with 19 homers -- more than any other backstop hit in either Class A circuit. His .492 slugging percentage also placed fifth in the league while his .814 OPS was eighth and his 128 wRC+ 10th. Those aren't the numbers of a glove-first catcher. They did get a big boost by Melendez's surge over the final month of the season. He hit .299/.396/.546 with four homers, two triples and eight doubles over 26 games in August after producing a .196/.283/.370 line over 24 games one month earlier. Those may be arbitrary end points, but they do indicate promising improvement from a high-school player who was eclipsing triple-digits in terms of games played for the first time. They also might speak to the benefits of coming from a baseball family where advice is always plentiful. "One big thing I heard from my dad's assistant coach at FIU, Tommy Duenas... He played in pro ball [from 2002-'07], and he's been helping me with the mental game," Melendez said. "Going into that last month, he was telling me, 'This is the most important month of the season. This is when everyone gets really tired, and you have the chance to prove yourself.' It brought out the real me." Holes still remain in Melendez's offensive game, however. His overall average with the Legends sat at .251, and he struck out in 30.3 percent of his plate appearances -- the 13th-highest K rate among the league's 61 qualifiers. Young, inexperienced hitters with promising power but major contact issues are abundant in the lower levels of the Minors (and increasingly abundant in the upper levels as well), but it's a group that Melendez has hoped to get himself out of beginning in 2019. He took a bit of an unorthodox approach to improving his batting eye by literally improving his eyes this offseason, working on visual training that included staring at two cards with circles, crossing his eyes to create a third circle and then uncrossing them quickly to get back to standard sight as quickly as possible. Melendez claims the technique was meant to work on his depth perception, which comes in handy on both sides of the ball -- even if he'd like to see the biggest improvement on the offensive end. "I wanted to work on swinging at strikes and laying off the bad pitches, and that kind of led me to eye training," he said. "I didn't really know what it would entail, but there's actually so much you can do. It helps with tracking the ball, reactions, timing, my ability to recognize certain pitches earlier, and these are all things you can do without being on the field. We talk all the time about reading the ball and recognizing spin, but we don't always know how to work on that. This was an opportunity to do that." Melendez is testing how much that work paid off this spring, which is likely to end with an assignment to Class A Advanced Wilmington to open his second full season. He'll probably be joined in the Carolina League by some of the most promising talent in the Kansas City system. No. 1 prospect Brady Singer, No. 4 Daniel Lynch, No. 7 Jackson Kowar and No. 9 Kris Bubic are all candidates to lead the Blue Rocks rotation as Melendez's batterymates after getting picked out of college in last year's Draft. No. 5 Nick Pratto, No. 6 Seuly Matias and No. 10 Kyle Isbel could feature alongside Melendez in the Wilmington lineup after the trio helped Lexington go 76-60 during the regular season en route to a Sally League title. Perez was a piece of the homegrown core -- with Alex Gordon, Eric Hosmer and Mike Moustakas (and other young contributors like Lorenzo Cain and Alcides Escobar) -- that led Kansas City to glory in the middle of the decade. Three stops away, Melendez hopes he can be the all-around backstop needed to help the Royals conquer the AL Central and beyond once again. "It gets us all even more excited," he said of winning the 2018 SAL title. "I know how good my teammates were last year, and those guys in Lexington, all of us were really looking forward to Spring Training just to keep it going. We can all move at the same rate. First, we just want to make this the best spring possible and then we want to go do the same exact thing, not only for us but all of the teams in the organization. We strive for championships here."